Customize your public profile URL. Add a LinkedIn background photo to your personal profile. Add a ProFinder Badge to your profile. Take advantage of the blog/website links on your LinkedIn profile. Search engine optimize your LinkedIn profile. Add, remove, and rearrange entire sections of your profile. Take advantage of Saved Searches. Find a job through via LinkedIn's job postings. Get endorsed for your skills. Use Open Profile to send messages to people you're not connected to. Check your Network Updates (or share your own). Check out who's viewed your LinkedIn profile. Easily find new connections -- or connect with old ones! Leverage @mentions in your status updates. Optimize your LinkedIn Company Page. Create targeted LinkedIn Showcase Pages. Post Company Status Updates (and target them!). Check out LinkedIn's Content Marketing Score & Trending Content resources. Experiment with LinkedIn Ads and Sponsored Updates. Create your own industry LinkedIn Group, and join other relevant groups. Experiment with publishing content on LinkedIn's publishing platform. Recruit new talent via LinkedIn Jobs. Analyze your LinkedIn marketing performance with the Analytics tab on your Company Page. In April, LinkedIn announced it had reached 500 million members, making it one of the most popular social networks for professionals and one of the top social networks overall. But are you using LinkedIn to its fullest potential? With new social networks sprouting up constantly, LinkedIn is a platform that often gets underutilized or put on the back burner. But the truth is, LinkedIn can be extremely powerful -- especially when you're aware of all the platform's hidden features that don't get nearly as much attention as they deserve. So to help you learn how to use LinkedIn effectively, this post is chock full of LinkedIn tips you may be overlooking ... but definitely shouldn't. Before we dive in, here's a quick little primer on LinkedIn for those of you who may be new to the social network. LinkedIn launched in 2003 and is currently the fourth most popular social network among U.S. adults. The social network is primarily centered around careers, and it enables users to connect and share content with other professionals, including colleagues as well as potential employers, business partners, and new employees. If you're a business on LinkedIn, it can also be a fantastic marketing tool. Now, are you ready for a treasure trove of LinkedIn tips? Let's get our hands dirty. Make your personal profile look more professional (and much easier to share) by customizing your LinkedIn public profile URL. Instead of a URL with a million confusing numbers at the end, it will look nice and clean like this: http://www.linkedin.com/in/amandazantalwiener. For detailed instructions on customizing your URL, click here. 2) Add a LinkedIn background photo to your personal profile. LinkedIn recommends a background photo size of 1584 x 396 pixels, and that it must be a JPG, PNG, or GIF file under 8MB. 3) Add a ProFinder Badge to your profile. Over the years, LinkedIn has made some changes to the types of Badges it offers. But depending on what you're trying to accomplish, you might want to consider adding a ProFinder Badge, which is used to identify freelancers within LinkedIn's ProFinder -- a service that matches contractors with project managers seeking help. Freelancers can display a ProFinder badge on their profiles to show prospective clients their skills, expertise, and recommendations. 4) Take advantage of the blog/website links on your LinkedIn profile. 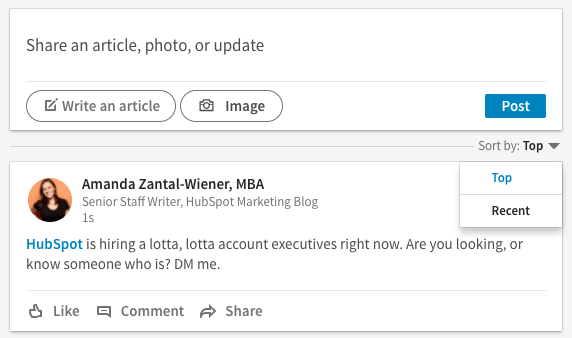 Instead of using the default anchor text links in the Websites list within your LinkedIn profile's Contact Info section, you can now add links to your portfolio and social networks, to name a few. Plus, you can also add links to your work under each job description -- so if you want to increase clicks, make sure you populate those areas with the online presence to which you want to draw the most attention. Even cooler: If you produced multimedia for a given job or assignment, you can now upload those files. 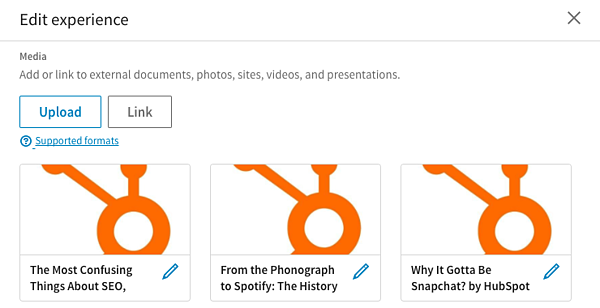 For example, if you've produced podcasts and want to feature that work, you can add links to something like SoundCloud tracks. 5) Search engine optimize your LinkedIn profile. SEO isn't limited to blogging -- it turns out, you can also optimize your profile to get discovered by people searching LinkedIn for key terms you want to get found for. You can add these keywords to various sections of your profile, such as your headline, your summary, or your work experience. LinkedIn also enables you to reorder entire sections of your profile in any way you prefer. When in edit mode, simply hover your mouse over the double-sided arrow in each section. Your mouse will turn into a four-arrowed icon, at which point you can click, then drag and drop to another position on your profile. Find a full list of sections to add to and remove from your profile here. LinkedIn allows users to save up to ten job searches and three people searches. After conducting a search, clicking the Save search option at the top right allows you to save a search and easily run it again later. You can also choose to receive weekly or monthly reminders (+ daily for job searches) via email once new members in the network or jobs match your saved search criteria. 8) Find a job through via LinkedIn's job postings. Now that you've optimized your LinkedIn profile, use it -- and LinkedIn Jobs -- to help you land a fabulous new position. Using its Advanced search feature, LinkedIn allows you to search for jobs by keyword, title, industry, location, company, function, experience level, and more. Also, based on your application history and saved searches, LinkedIn can send suggestions of jobs you might be interested in, relating to location, company size, and industry. 9) Get endorsed for your skills. Back in 2012, LinkedIn launched a feature called Endorsements, which enables users to endorse their connections for skills they’ve listed in the Skills section of their profile -- or recommend ones they haven’t yet listed. These endorsements then show up on your profile within that same Skills section, as you can see in the screenshot below. Okay, so you can't guarantee your connections will endorse you for those skills, but because it's so easy for your LinkedIn contacts to do (all they have to do is click on the + sign next to a particular skill on your profile), you'll find that many of them will do it anyway. Also, when people visit the site, LinkedIn will often prompt them to endorse their connections passively. Just make sure your profile is complete and you've spent the time to list the skills you want your contacts to endorse you for -- it will definitely give your profile a bit of a credibility boost. 10) Use Open Profile to send messages to people you're not connected to. 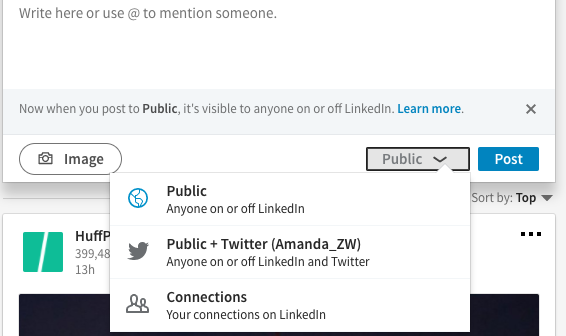 With the exception of your fellow group members (more on this later), LinkedIn only allows you to send messages to people who you share a first-degree connection with. But did you know some people let you send them messages anyway, even if you're not connected? The ability to be part of the Open Profile network is only available to premium account holders, but it allows those users to be available for messaging by any other LinkedIn member (regardless of their LinkedIn membership level) if they choose to be. There are other options for sending messages to those with whom you're not yet connected, like sending a request to connect with a note -- though we don't recommend overdoing this one. Or, if you have a premium account, you can use InMail. 11) Check your Network Updates (or share your own). Found on your LinkedIn homepage, Network Updates are essentially LinkedIn's version of the Facebook News Feed. Check this feed periodically for a quick snapshot of what your connections are up to and sharing, or share updates of your own, such as noteworthy content related to your industry/career, content you've created yourself, etc. You can also sign up for email notifications, and sort by Top Updates or Recent Updates to filter your feed in one way or the other. Allow others to see who you are if you view their profile. To enable this, visit your Settings (click your thumbnail image in the top right and click Privacy & Settings) and click "Profile viewing options" under "Privacy." Make sure you check off the Your name and headline (Recommended) option, as it will allow you to take advantage of the next feature on our list. 13) Check out who's viewed your LinkedIn profile. How? With the Who's Viewed Your Profile feature, of course. This tool, which is accessible in the main navigation via the Profile dropdown, enables you to identify which other LinkedIn users have visited your profile page (so yeah, exactly what it sounds like). In fact, LinkedIn gave this coveted creeper feature a facelift in February 2014, so the information it provides is even better than ever. You can also see how you stack up against the profile views for your connections, people in your company, and other professionals like you. Want to transfer your LinkedIn connections to another contact management system? Luckily, LinkedIn enables you to export your connections. 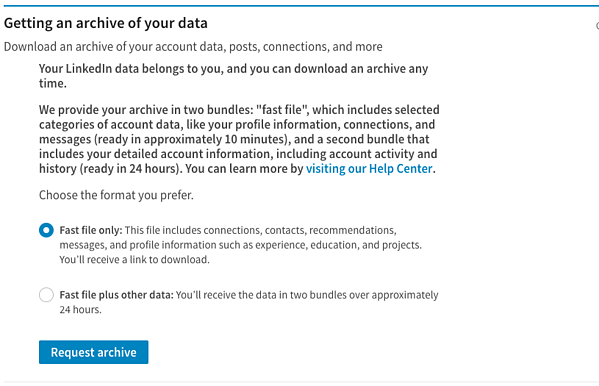 Go to your account settings, and under "Basics," click "Getting an archive of your data." That will allow you to download a file that includes data on your LinkedIn account, including your connections. 15) Easily find new connections -- or connect with old ones! Speaking of connections, the Connections tab in the top navigation offers a variety of other tools to grow and connect with contacts in your professional network. When viewing your connections, click the right-hand side display that says, "Manage your synced and imported contacts" From there, you'll be able to sync your email contacts to see who's on LinkedIn, and who you can invite to join. 16) Leverage the perks of LinkedIn Groups. Did you know that if you're a member of the same group as another user, you can bypass the need to be a first-degree connection in order to message them? As long as you've been a member of LinkedIn for at least 30 days and a member of the particular group for at least 4 days, LinkedIn allows you to send up to 15 free 1:1 messages to fellow group members per month (across all groups you belong to). In addition, group members are also able to view the profiles of other members of the same group without being connected. Join more groups to enable more messaging and profile viewership capabilities -- and be sure to participate in the discussions. 17) Share your LinkedIn status updates on Twitter. Ever since the big LinkedIn/Twitter breakup of 2012, you can no longer automatically sync your tweets to publish on LinkedIn. But don't fret -- as long as you add your Twitter account to LinkedIn, the opposite is still possible. 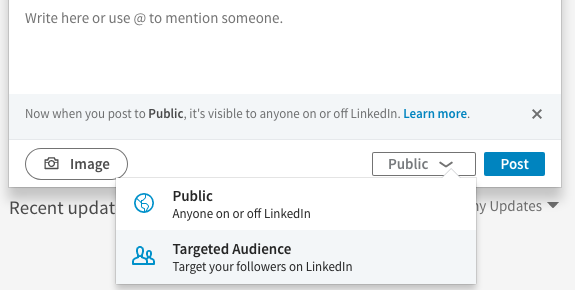 So if you're ever posting an update to LinkedIn that you'd also like your Twitter followers to see, you can easily syndicate that update to Twitter by selecting the Public + Twitter option in the dropdown menu within the LinkedIn update composer. 18) Leverage @mentions in your status updates. In 2013, LinkedIn rolled out the ability to tag or @mention other users and companies in status updates -- much like the way it works on Facebook, Twitter, and Instagram. Want another LinkedIn user or company to see your status update? Include the @ symbol immediately followed by the user's/company's name in your status update. As a result, that user/company will get alerted that you mentioned them, and their name will also link to their profile/page in the status update itself. 19) Optimize your LinkedIn Company Page. 20) Create targeted LinkedIn Showcase Pages. LinkedIn Showcase Pages are niche pages that branch off your main Company Page. Think of them as extensions of your main Company Page that allow you to promote specific products or cater to your individual marketing personas, providing a more personalized experience for your Company Page visitors. LinkedIn users can also follow specific Showcase Pages without having to follow a company's main page or its other Showcase Pages, allowing your business to tailor the page closely to the audience specific to the page. To create a Showcase Page, go to your Company Page and click "Manage page." Then, at the top, click "Admin Tools," and select "Create a Showcase Page." Find more information about Showcase Pages here. 21) Post Company Status Updates (and target them!). Make the most of your LinkedIn Company Page by publishing Company Status Updates for all your page followers to see. This will give LinkedIn users even more reason to follow your Company Page, growing your LinkedIn reach. For a high-level guide to these updates, click here. Been using Company Status Updates for a while? Why not step it up a notch and leverage the power of segmentation with LinkedIn's targeting options, which enable you to target your status updates to specific users? Company Page administrators can target their updates using criteria like company size, industry, job function, seniority, geography, language, or by including/excluding company employees. 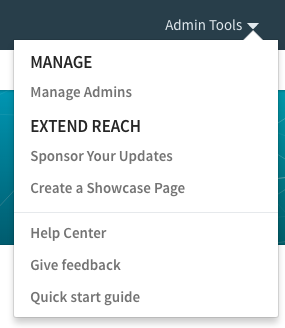 These targeted updates will appear on the Company/Showcase Page itself for those users as well as in the users' Network Updates feed on their LinkedIn homepage. 22) Check out LinkedIn's Content Marketing Score & Trending Content resources. If you're a LinkedIn Business Solutions customer, you can learn how impactful your organic and paid LinkedIn content is with the Content Marketing Score and Trending Content resources. Your Content Marketing Score measures user engagement with your Sponsored Updates, Company Pages, LinkedIn Groups, employee updates, and Influencer posts (when applicable). It then provides recommendations for how you can improve your score, and thus the effectiveness of your LinkedIn content. 23) Experiment with LinkedIn Ads and Sponsored Updates. If you're looking to complement your organic LinkedIn marketing efforts with some paid advertising, LinkedIn Ads are a smart choice. 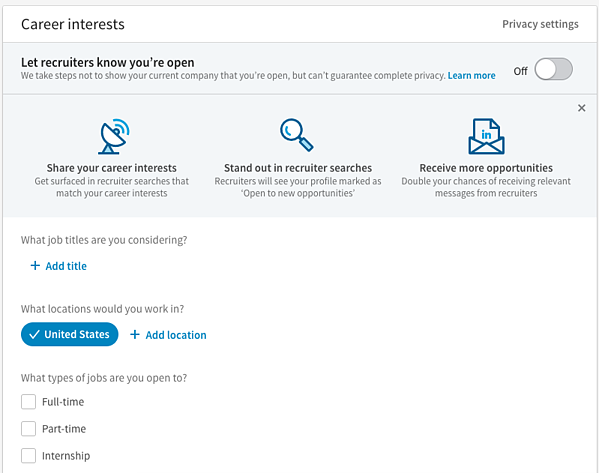 One of the biggest benefits of LinkedIn advertising: the targeting options. LinkedIn’s PPC ads let you target specific job titles, job functions, industries, or company size, to name a few -- you know, the people who are more likely to want/need what you sell. If you want to get started with LinkedIn's advertising platform, check out our free guide to advertising on LinkedIn here. 24) Create your own industry LinkedIn Group, and join other relevant groups. Consider creating a LinkedIn Group of your very own, like HubSpot did with our popular Inbound Marketers Group. Create a group based on a relevant industry-related topic, and become a LinkedIn Group administrator. 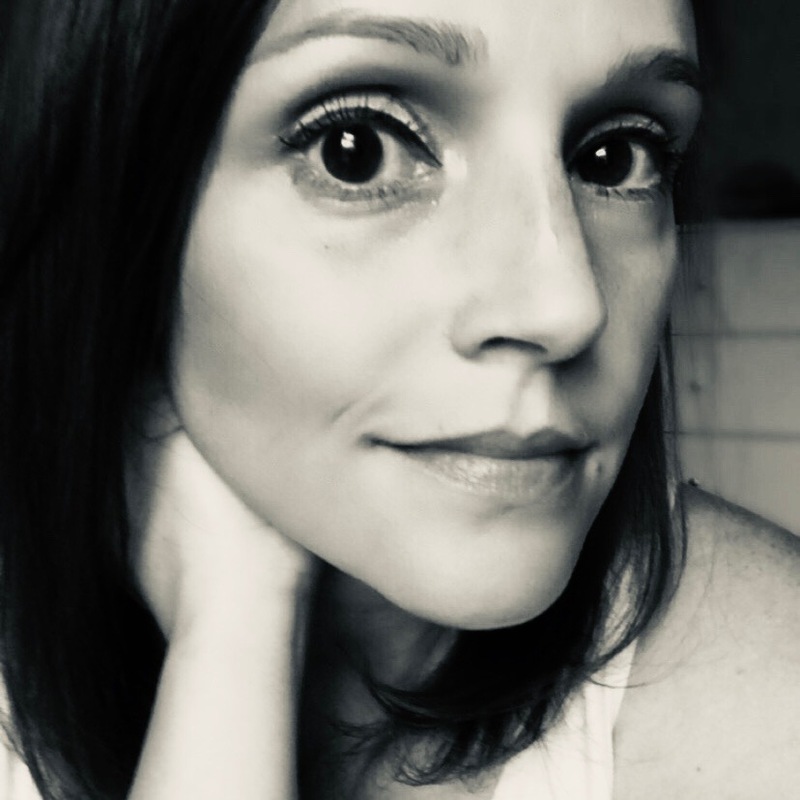 You can then use this group to establish yourself as a thought leader in your industry, grow a community of advocates, generate new marketing content ideas, and even generate new leads -- more on that next. You should also consider joining (and getting executives from your business to join) other relevant groups and participating in discussions to exhibit thought leadership in your industry. 25) Email your LinkedIn Group. One of the perks of managing a LinkedIn Group is the fact that you can email all the members of your group -- up to once per week. These emails take the form of LinkedIn Announcements, which are messages sent directly to the email inboxes of group members (if they've enabled messages from groups in their settings). It's a prime opportunity for generating leads from LinkedIn, particularly if you've built up a robust group of users. 26) Experiment with publishing content on LinkedIn's publishing platform. Good news! You no longer have to be a LinkedIn Influencer to publish new articles to LinkedIn. Publishing is available to all users, ever since a February 2014 feature announcement. Experiment with how this feature can support your marketing goals by creating content for the platform and promoting it via your Company Page. For example, you could experiment with syndicating content from your business blog to LinkedIn Pulse and using it to promote subscription to your full blog. To publish an article, click "Write an article" on the update box on your LinkedIn homepage. From there, you'll be taken to the publishing platform, where you can compose your draft. 27) Recruit new talent via LinkedIn Jobs. Looking to fill a position or two on your marketing team -- or another department within your company, for that matter? Then be sure to build out the Jobs section of your Company Page, which you can use to promote your available job openings. The look and feel of your Jobs page depend on what information and images you choose to include, such as a list of jobs, people at your company, a summary section for your careers, what employees are saying about working at your company, and recent updates. Furthermore, if you're actively recruiting candidates with specific skills and expertise, this goes both ways -- you can use LinkedIn's various search criteria to find the best fit. Here's another look at HubSpot's Company Page -- notice how the job listings are prominently displayed on the right. 28) Add the Company Follow and LinkedIn share buttons to your website/content. Promote your company's LinkedIn presence and help grow the reach of your Company Page by adding the Company Follow button to your website. Also consider adding the LinkedIn Share button to your various content assets like blog posts, emails, and landing pages to extend the reach of your content to LinkedIn users. 29) Analyze your LinkedIn marketing performance with the Analytics tab on your Company Page. So ... how are your LinkedIn marketing efforts faring? Use your Company Page Analytics to evaluate the performance of your Company Page. This feature offers data about the effectiveness of your page's status updates, engagement, and reach, as well as information about your page's followers -- demographics, where they came from, how your following has grown over time, how your data compares to other companies. Ready to get started? Great. With so many changes and features added to LinkedIn since its very first launch, we can't wait to see how the network continues to make itself indisposable to job seekers, marketers, and other professionals.